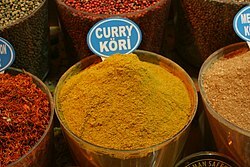 Curry powder is a spice mix originating from the Indian subcontinent. Spice blends were found to be in use almost 4000 years ago, with key ingredients like ginger, garlic, and turmeric, during the days of Indus Valley Civilization. The chili pepper, a ubiquitous ingredient in curry, was brought to the Indian subcontinent from the Americas through the Columbian Exchange in the 16th century. Curry powder and the contemporary English use of the word "curry" are Western inventions and do not reflect any specific food from the Indian subcontinent, though a similar mixture of spices used in the Northern regions of the Indian subcontinent is called garam masala. Curry powder was used as an ingredient in 18th century British recipe books. After Britain colonized India, it was introduced to Japan where it became known as Japanese curry. ^ "The Mystery of Curry". Slate magazine. ^ "McCormick Gourmet™ Organic Curry Powder - McCormick Gourmet". www.mccormick.com. ^ "McCormick Gourmet™ Organic Curry Powder, Red - McCormick Gourmet". www.mccormick.com. ^ Page, Martin (2007). The First Global Village: How Portugal Changed the World. Casa das Letras. p. 148. ISBN 978-972-46-1313-0. ^ "NDL/FNIC Food Composition Database Home Page". Nal.usda.gov. Archived from the original on 3 March 2015. Retrieved 22 October 2013.